Visit any of the cloud obsessed blogs, discussion forums, or conferences and you’ll hear the same “reasons” as to why cloud computing isn’t catching on within enterprise IT shops. It’s always something about interoperability, service level agreements, security risks, data formats, APIs, or hypothetical legal implications. Interesting issues, but they are all red herrings. The inability of enterprises to take advantage of the clouds isn’t due to the shortcomings of the cloud offerings available today. The shortcoming is with the state of today’s enterprise IT shops. The real reason is that those millions of applications currently running within enterprises are hardwired into a particular environment. I’m not talking about the application code itself. After all, Linux is Linux and Windows is Windows no matter if it’s running on native hardware, a local VM, or somewhere in a cloud. The true problem is with the way today’s applications are configured, deployed, and managed. Very few folks in enterprise IT are willing to admit to the hairballs that decades of shortsighted IT Management techniques have created. The often offered up excuse of there being “a lack of cloud skills within the enterprise” is really just code for a general abundance of poor to outrageously awful IT Management techniques. Let’s look at a basic and often quoted use case for cloud computing. With server utilization rates in the 3-15% range, there is obviously room for significant reduction in capital expenditures by taking advantage of cloud-based elastic computing resources. Why isn’t there a rush of enterprises running to take advantage of this? No, the answer isn’t the often quoted fear of vendor lock-in. The answer is that these enterprises are locked into themselves. Think of how difficult it is for an enterprise to switch datacenters. Months of effort go into planning and executing the move, but have you ever heard of one going smoothly? If it takes months to move between your own datacenters and you still can’t get it right, what hope do you have for making it into the clouds? It’s no coincidence that the local virtualization vendors like VMware and Parallels are facing this same denial of such an obvious business case as they attempt to push their offerings out of development and testing environments and into production environments. Rob England (TheITSkeptic) is one of the few pundits to point out the fundamental disconnect between enterprise IT and the clouds. He attributes the largest hurdle to migration costs. I would take it a couple of steps further. Migration is just a symptom of the problem. If migration was the only problem, using cloud infrastructure would be a slam dunk for new application projects. But, of course, the same old broken management techniques ingrained in an enterprise plague new and old projects alike. The bottom line is that what passes for the status quo in IT Management is crippling enterprises. Enterprise IT can’t take full advantage of such fundamental advances as virtualization and elastic computing until an “abstracted administration” paradigm becomes standard operating procedure. Abstracted administration means the ability to work from a point of view that is independent of any particular server instances or specific software deployments. Within the abstracted administration paradigm, an administrator manages deployment and ongoing operations from a higher level and lets the underlying framework coordinate operations across the actual physical environment. Once you’ve achieved abstracted administration, moving datacenters or re-deploying an application to virtualized servers in the cloud is as simple as updating one part of the specification that drives the abstraction. Your tools will then handle the rest. Of course, achieving abstracted administration means that the provisioning and management of your entire application stack — from OS install to running integrated application services — must be fully automated using tools that support this specification-driven, abstracted administration paradigm. If you look at what passes for state of the art in many IT shops, it might seem like the ability to achieve abstracted administration and fully automated provisioning is a long ways off. That is simply not the case. The tools to get this done are already here, they work well, and they are all open source. 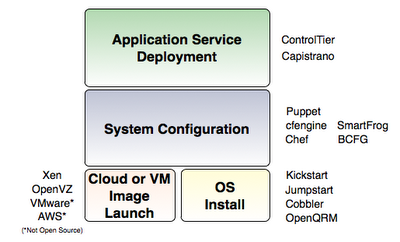 Below is a diagram of an open source toolchain that can provide fully automated provisioning. Still not convinced it can be done? Check out this whitepaper. The paper lays out how fully automated provisioning can be (and has been) achieved using these standard open source tools. If you are interested in more detailed explanation of the abstracted administration paradigm, check out this detailed post by Alex on the ControlTier Blog.